I’ve been playing with my Greek parser lately and I decided to annotate a few verses of text. I did Mark 1:1-2 with a free translation. Unfortunately, I haven’t yet determined how to simply copy and paste this and keep everything aligned in WordPress, so I’ve just done a screen capture instead. I also didn’t put too much effort into the translation. Look, I am sending my messenger ahead of you who will prepare your way. γέγραπται Aorist? “was written”? Maybe I’m not reading your abbreviations correctly. The “stv” is Stative. I’m using the semantic values of the stem forms rather than the traditional labels. I know that whether the perfect is stative or not is debated, but I think it’s a valid possibility. With that said though, I need to go back and fix part of it – γέγραπται, as a M/P, most definitely does not take Subject-Agent, Object-Theme constituents (that’s the S-A, O-T). There are a few other small errors that I made on a couple other words too. Is there more stuff like this that is entered into FLEx or FLEx-like system? Yeah, I’ve done quite a bit of work in building my database (started in May 08). Most of the work, though, has been background stuff — the pay off has only recently begun to materialize. So are you going to release any of that goodness sometime? At this point, I don’t know what’s going to happen with it. I’d like to make it available at some point though. When it will be ready for that…I don’t know. For the time being, its a tool for me to help me with my thesis project on Greek syntax. Speaking of FLEx, have you used phonology assistant at all? It’s pretty much amazing. 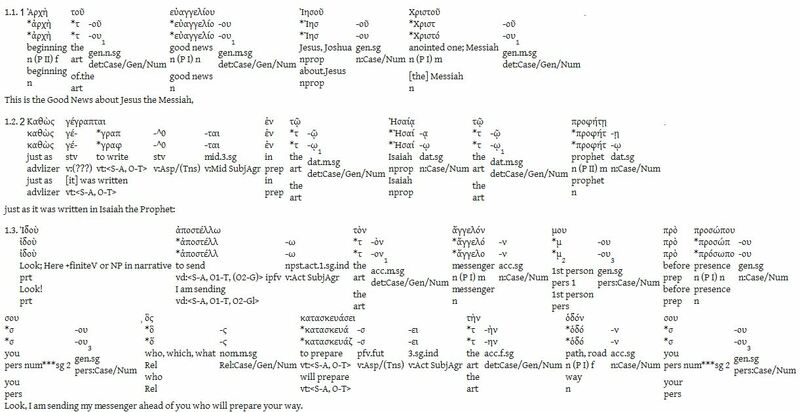 I love phonology assistant. Now I wish I still had my data for Russian! I don’t know how possible it would be for using it on Hellenistic Greek & written texts…but it’s a great program!